Ray Harryhausen's work has astonished film fans for decades and now three of his most revered films he worked on will get the premium treatment courtesy of Warner Bros. Home Entertainment. This new collection features revered films across all genres celebrated in a premium package set containing the film on Blu-ray, DVD and a Digital Copy giving fans a must own version that allows them to watch however they choose. Each release also includes a collectible slipcase and artcards featuring the films' key art and lobby cards style stills. Before history and beyond imagination! The machinations of gods above and the fates of man and monsters here below play out in a Clash of the Titans Decades prior to the sensational 2010 version of the tale, Harry Hamlin took up sword and shield to play valorous Perseus, mortal son of Zeus (Laurence Olivier), who sets out to fulfill his destiny by rescuing beloved Andromeda from the wrath of goddess Thetis (Maggie Smith). Perils await Perseus time and again. And eye-filling thrills await viewers as stop-motion effects legend Ray Harryhausen (Jason and the Argonauts) unleashes snake-haired Medusa, fearsome Kraken, winged Pegasus, two-headed dog Dioskilos, giant scorpions and more. Rejoice, fantasy fans: the movie gods gift us with adventure that's innovative, heroic, titanic. Near the Arctic Circle, an atomic bomb is detonated. This fearsome experiment disturbs the sleep of a giant rhedosaurus encased in ice for over 100 million years and sends it southward on a destructive, deadly rampage! The Beast from 20,000 Fathoms was the first screen adaptation of a work by fantasy-fiction titan Ray Bradbury. It also marked the first time Ray Harryhausen had total control over special effects. He came up with a fantastic creature (constructed at full scale, all 50 tons of it) that swims down from the north to run amok through New York City before being conquered in a spectacular Coney Island roller-coaster finale. Two documentaries: The Rhedosaurus And The Rollercoaster: Making The Beast And Harryhausen & Bradbury: An Unfathomable Friendship Armatures. Cowpokes head into a mysterious Mexican valley to head ’em up and move ’em out. But they’re not looking for little dogies. They’re looking for great, big dinosaurs. 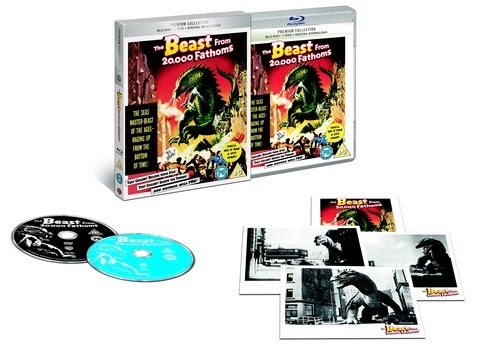 James Franciscus stars in this thunderous adventure featuring amazing special effects by Ray Harryhausen (The Beast from 20,000 Fathoms, Clash of the Titans). Franciscus plays a Wild-West showman who leads his riding and roping crew into the title region where prehistoric giants still roam. Thanks to Harryhausen wizardry, fantastic creatures lunge, fight and rampage in scene after dazzling scene (including an awesome sequence where the cowboys rope Gwangi, a razor-toothed allosaurus). Saddle up and join the excitement. Return to the Valley recounts the making of the film with Associate Producer/Creator of special effects Ray Harryhausen. Labels: 000 Fathoms, Clash Of The Titans, Ray Harryhausen, The Beast From 20, The Valley Of Gwangi, Warner Bros.